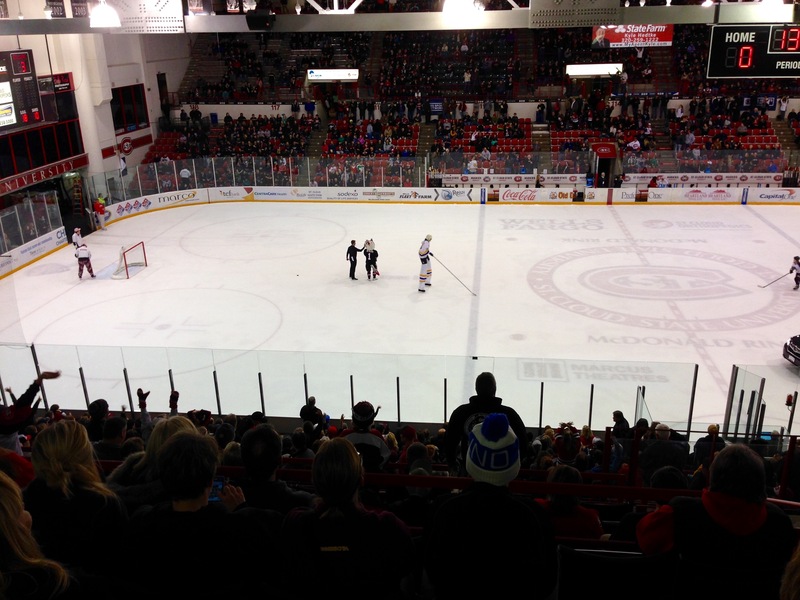 The home of the St Cloud State University Huskies was the final D-1 rink in Minnesota for me to catch a game in. 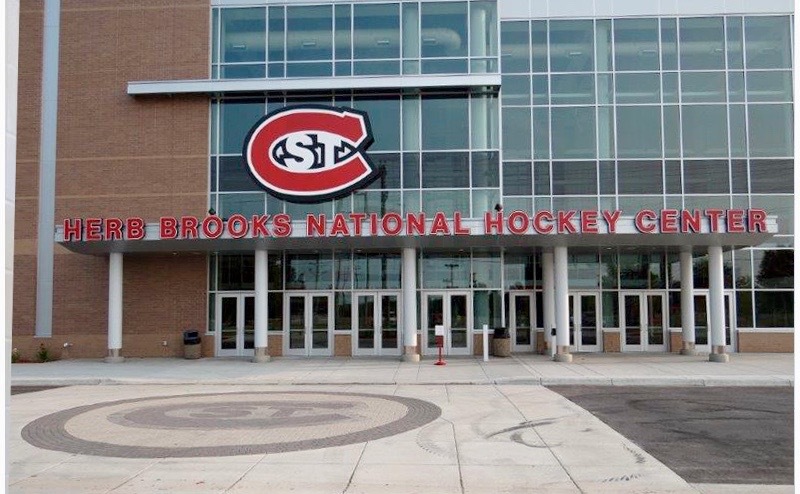 The facility is named after Coach Herb Brooks, who was instrumental in the St Cloud program moving up to Division One. The main rink is named after late university President Brendan J. McDonald, who was also a huge advocate for the D-1 move. Completed in 1989, the Brooks Center is a no-frills kind of ice rink, seating 5159 for hockey; there is minimal seating at the ends and a low ceiling. It also has the worst PA system of any rink I’ve been in. But it’s a loud arena for the home town Huskies, and the student section: The Dog Pound, is as raucous as they get. 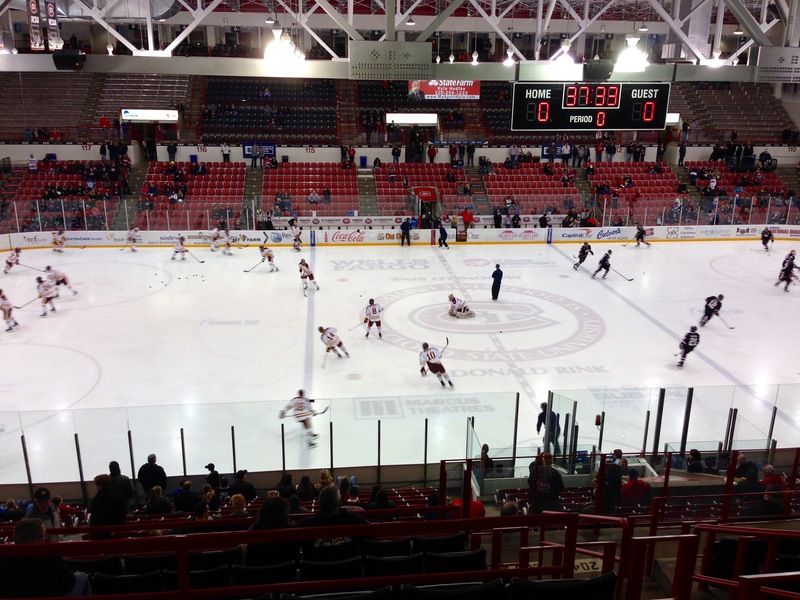 The Duluth Bulldogs were in St Cloud to try to keep their home ice in the first round of the playoffs. St Cloud would be trying to stay tied at the top of the NCHC with North Dakota. The Bulldogs set the tone early, with a goal in the first 39 seconds. Both teams were flying, but it was UMD that would expand their early lead. UMD worked a delayed penalty to perfection, keeping the puck away from St Cloud until Brenden Kotyk buried the puck behind Husky goaltender Charlie Lindgren. Then UMD went on the power play, and Karson Kuhlman scored unassisted to give Duluth a very sudden 3-0 lead. Duluth gave a clinic on how to take the early lead and then just hang on. St Cloud is a very fast team, and their puck movement is impressive. They peppered Duluth goaltender Kasimir Kaskisuo with 14 SOG in the second, but only put one past him. Kaskisuo turned away another 21 SOG in the third, but did not allow a goal. UMD’s Kuhlman added his second goal of the game, an empty netter, for the 4-1 Duluth win. Kaskisuo faced 50 shots total, and Lindgren faced 35. Attendance was 4861. Second period entertainment: “Too Tall Ike” skates around on 4′ high stilts, dressed as one of the Hanson bros. This entry was posted on Saturday, February 27th, 2016 at 7:23 PM	and tagged with driving, hockey, ice, Minnesota, photo, scsu, travel, umd and posted in sports. You can follow any responses to this entry through the RSS 2.0 feed. Congrats on completing the state of MN Div. I hockey arena cycle. How many total Div. I hockey arenas have you attended a game at ? ?